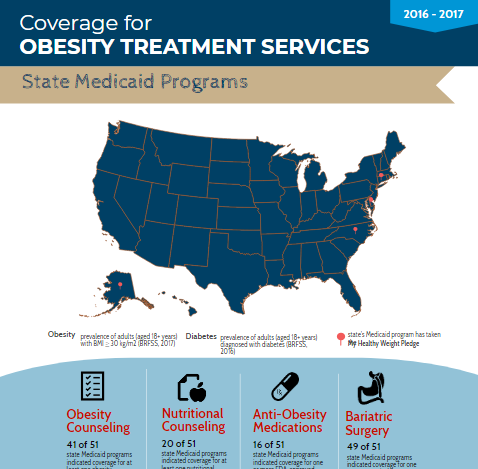 Since 2010, the STOP Obesity Alliance has conducted an annual state-by-state analysis of Medicaid coverage for obesity prevention and treatment. The research deals with three main areas of concern: coverage for bariatric surgery, pharmaceutical therapy, and counseling. Because obesity treatment varies person to person, patients require access to a wide range of treatments for effective management. Adequate coverage of broad services will ensure that anyone with obesity has access to individualized care. 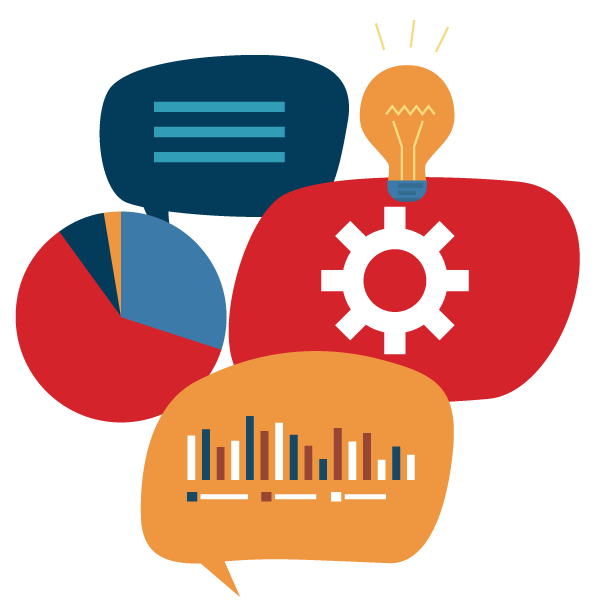 The DocStyles web-based survey instrument, developed and administered by Porter Novelli, contains 144 questions designed to provide insight into health care professionals’ (HCPs) attitudes and counseling behaviors on a variety of health issues. Beginning in 2015, STOP purchased space to include a handful of obesity-specific questions to assess HCPs’ beliefs, practices, and knowledge regarding effective treatment modalities and current clinical guidelines for obesity management. The 2016 survey assessed health care professionals’ (HCPs’) knowledge of evidence-based guidelines for nonsurgical treatment of obesity. 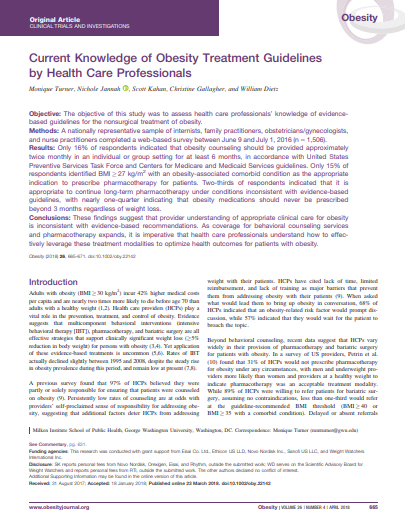 The results indicate that most providers lack knowledge and understanding of recommended obesity treatments, such as behavioral counseling and pharmacotherapy. Providers cite lack of time, lack of reimbursement, and lack of knowledge as major barriers to treating patients with obesity. The research was published in the journal Obesity in March of 2018. The 2015 survey found that despite the high prevalence of obesity among U.S. adults, provision of intensive behavioral counseling, pharmacotherapy, and bariatric surgery remains low. STOP researchers published two articles with results from the 2015 survey. 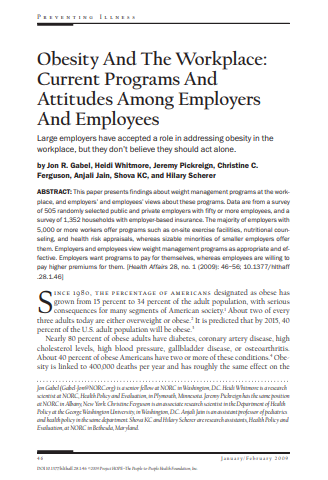 STOP commissioned a series of surveys in 2008 to determine the attitudes and beliefs of employees and employers on obesity in the workplace, which were published, in an article in Health Affairs. 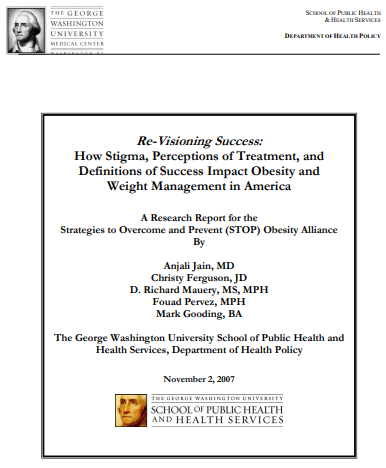 In 2007, STOP released a paper based on research that examined what may contribute to the disconnect between the scientific data demonstrating the harmful health and economic effects of overweight and obesity and the insufficient action to change the public and private sector systems that form barriers against effective weight management. The paper looked at factors contributing to the disconnect and proposed possibilities for bridging it as a way of improving health and productivity in America. STOP Director, Dr. Bill Dietz, published an article in Health Affairs in 2015, along with a group of co-authors with expertise in research, clinical care, health policy, and public health. The article offered a new model for addressing the obesity epidemic, one that reaches beyond clinical intervention to include community systems as well. 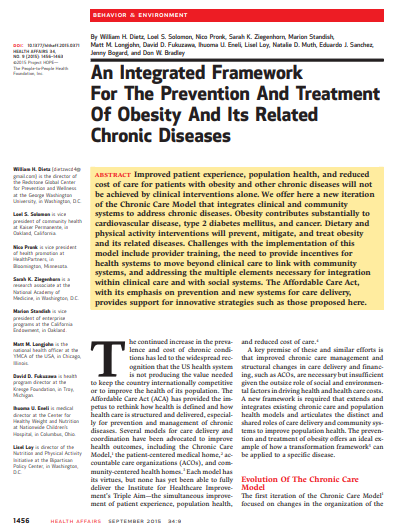 The paper proposes a modern framework, integrated in its approach to address both the prevention and treatment of obesity and its related chronic diseases. Accompanying the article is a figure which illustrates this proposed framework. 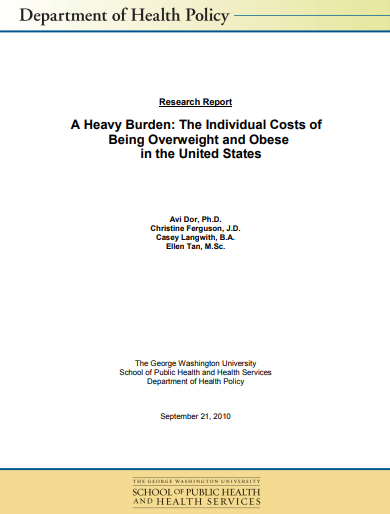 GW released a report in September 2010 titled, “A Heavy Burden: The Individual Costs of Being Overweight and Obese in the United States,” revealing the high costs of obesity to individuals in the United States. The research takes into account costs related to medical care, absenteeism from work, short-term disability, lost productivity and the need for extra gasoline, and found that the annual cost of being obese is $4,879 for a woman and $2,646 for a man. The data included in the report, coupled with the widely reported societal costs of obesity, highlight the enormity of the financial impact of the epidemic to the individual and underscores the critical need for policies that focus on prevention and treatment for those who are already diagnosed with obesity.